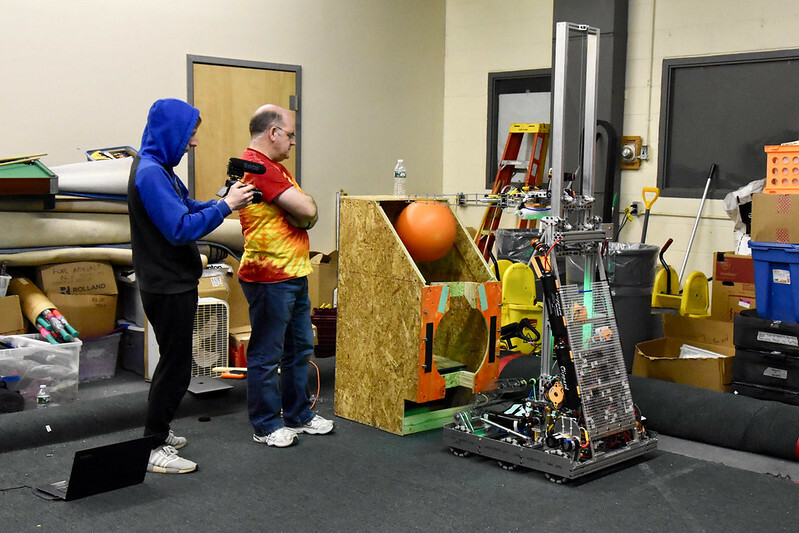 As we reported in our last blog post, we kept several key mechanisms of our robot “out of the bag” as part of our official, 30-pound “withholding allowance” after we stored our competition robot until our first tournament next weekend. The most important items we kept out were the polycarbonate claw that will manipulate both of the game pieces, and the intake that rolls the Cargo ball into the claw. Our claw handles the Hatch Panel disk and Cargo ball perfectly once it acquires them, but we have had trouble with the ball bouncing around after it’s rolled into the robot by the intake, and before the claw can grasp it. That wastes time and risks our losing control of the ball as the robot drives around. Mark and co-head coaches Igor Tepermeister and John Fitzpatrick talk about revising the ball intake mechanism. This week we moved the claw forward so that it can grab the ball earlier in the intake process, and also moved forward the piston that pushes the ball out of the claw so that it can stabilize the ball within the claw. We removed a bar across the front of the robot that we added a few weeks ago. It was supposed to stabilize the ball as it rolled in, but was not doing its job. Now that it’s gone, voilà, the ball goes right into the claw and stays there until we’re ready to push it out! Thanks to having a second robot on which to test these improvements, we can go to the SE Mass. District Event in Bridgewater confident that our robot will perform well. Asa and co-head coach Igor Tepermeister check the alignment of the intake chain. 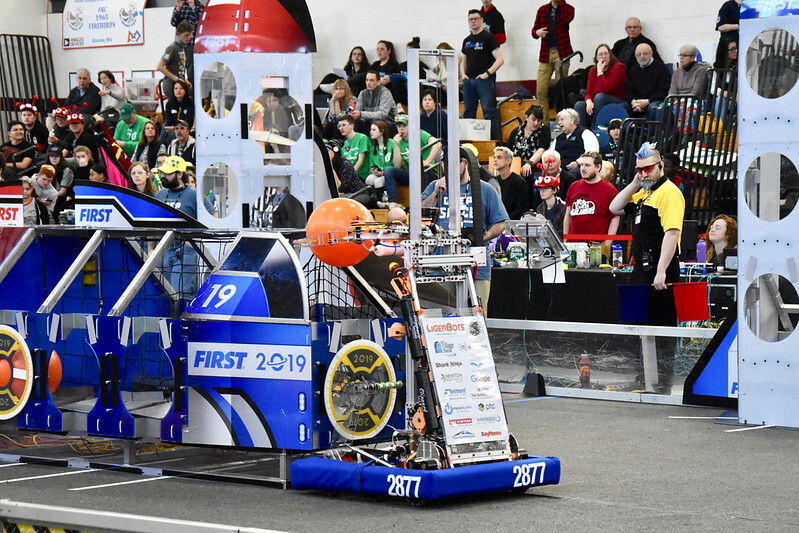 We also continued work on our bumpers, which are both complicated and very cool because their cloth covers can be inverted without removing them to change from red to blue, depending on our alliance color for that match. Charlotte and Amanda work on the flippable bumper covers. A tie was broken in the team-wide vote for a robot name by the flip of a coin. 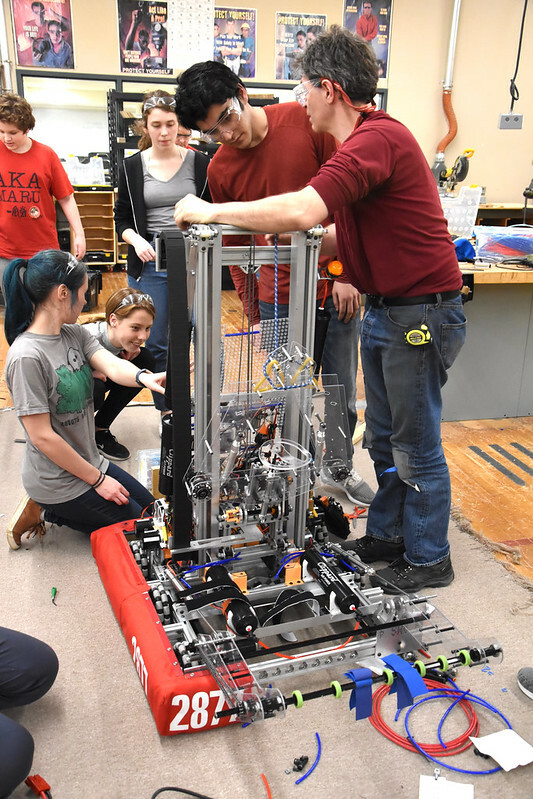 Our 2019 robot will be named Thanos, (after the Marvel Comics villain,) which means “immortal” in Greek. 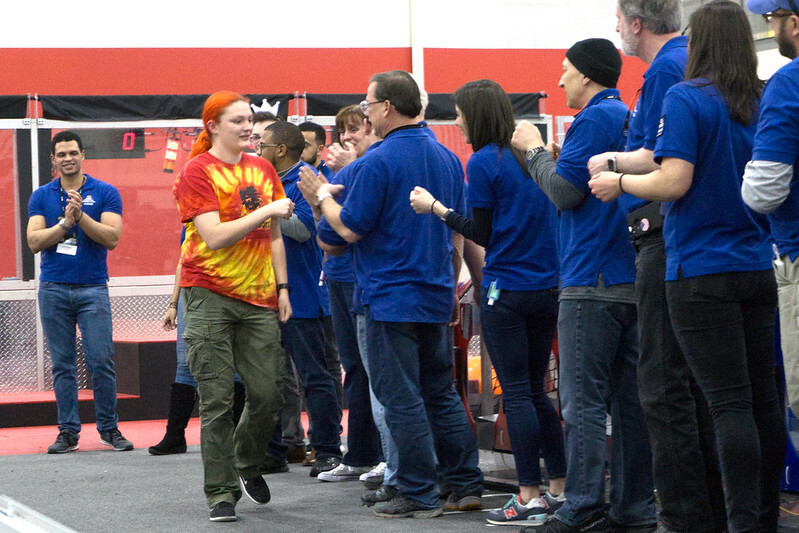 Co-head coach Noa Rensing helps break the robot naming tie by flipping a coin, as team members watch. Our strategy council held a session on data mining, led by project management mentor and sports statistics expert Dan Lavoie. We hope to use these skills in our analysis of robot performance data from New England FRC teams at our tournaments. 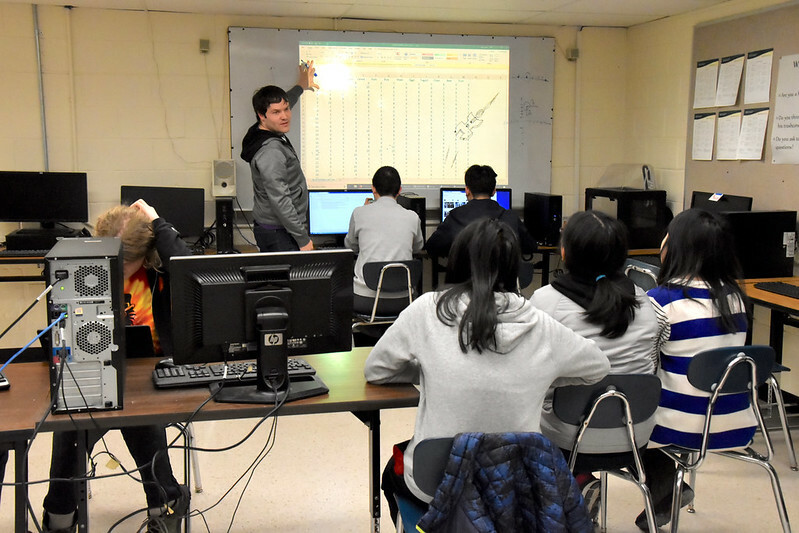 Mentor Dan Lavoie leads a session on data mining. We started to repair the ball-throwing arms on our 2016 robot, which continues to get heavy use at outreach events. We will replace the long-lost adjustable arm tips with a simpler and more robust, spoon-like mechanism that can throw the ball repeatedly without breaking. 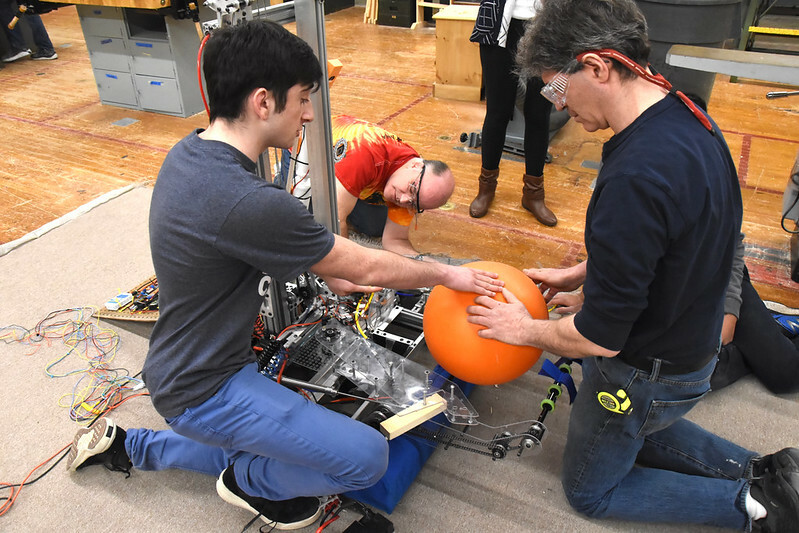 Peter and Brad repair the ball-throwing arm on the 2016 robot. 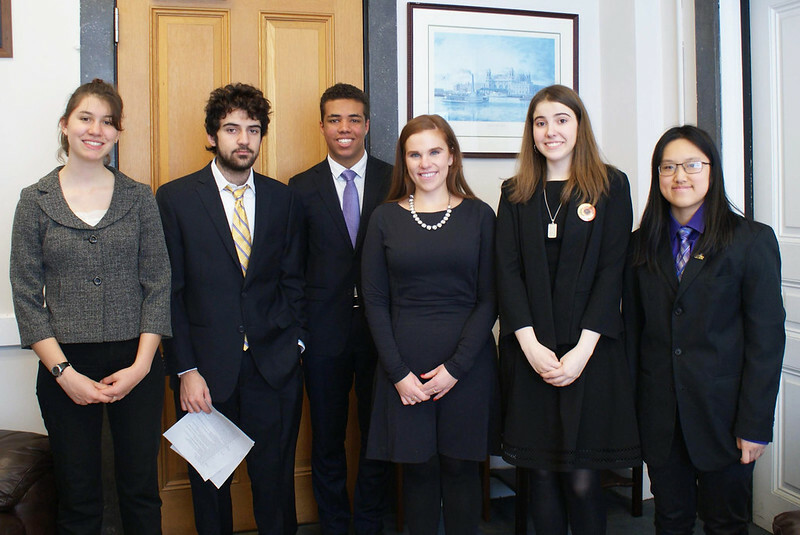 While our team engineers worked in their shop clothes this week to revise our intake mechanism a group of LigerBots went in business suits to the FIRST Southern New England Advocacy Conference. 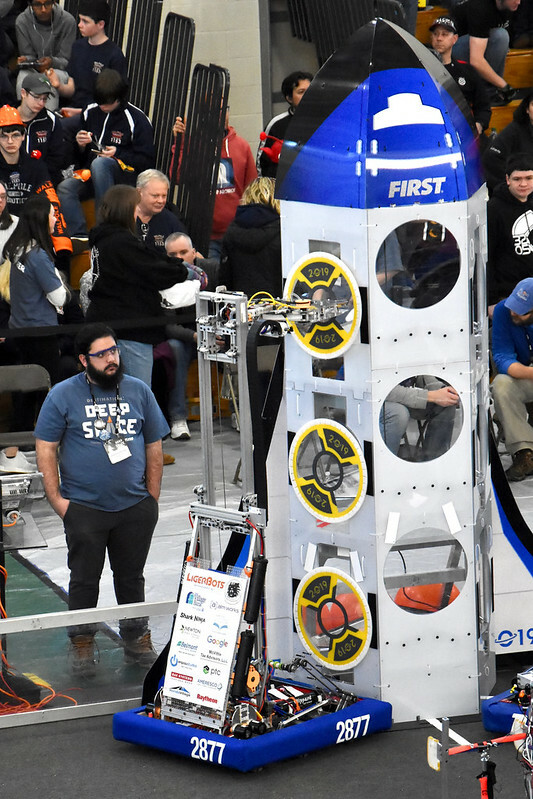 This was a two-day event designed to teach regional FIRST Robotics and FIRST Tech Challenge teams how to promote FIRST with our state governments, with the ultimate goal of securing state funding for STEM initiatives and FIRST teams. The conference was intended as a first step in building relationships with government officials and helping to educate them about FIRST. 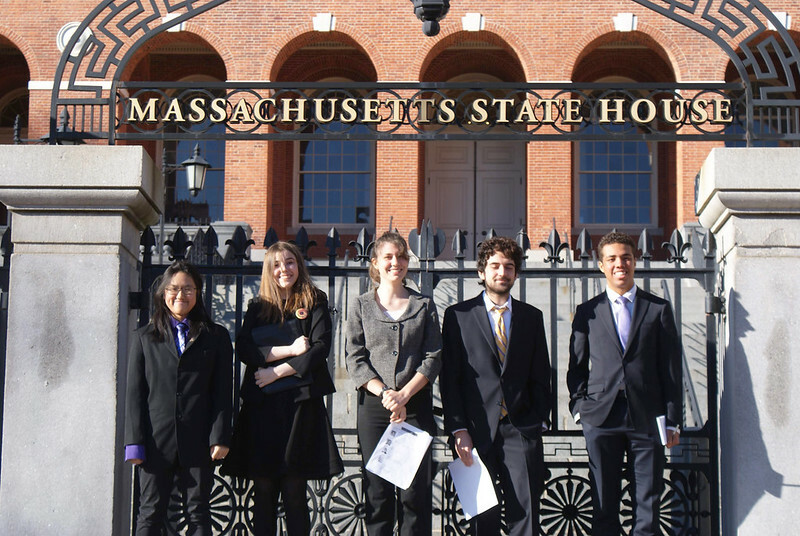 On the first day of the conference five LigerBots and our electrical mentor, Carly, listened to presentations at Worcester Polytechnic Institute about how state laws are made and how to communicate effectively with politicians. They attended break-out sessions to practice what they planned say to our representatives. On the second day LigerBots went down to the Massachusetts State House in Boston to meet with four state legislators (or their staff) who represent Newton: representative Ruth Balser, state senator Cynthia Stone Creem, Catherine Anderson from the office of Senator Creem, Emily Izzo from the office of representative John Lawn, and Amani Mansour from the office of representative Kay Kahn. LigerBots with Mass. 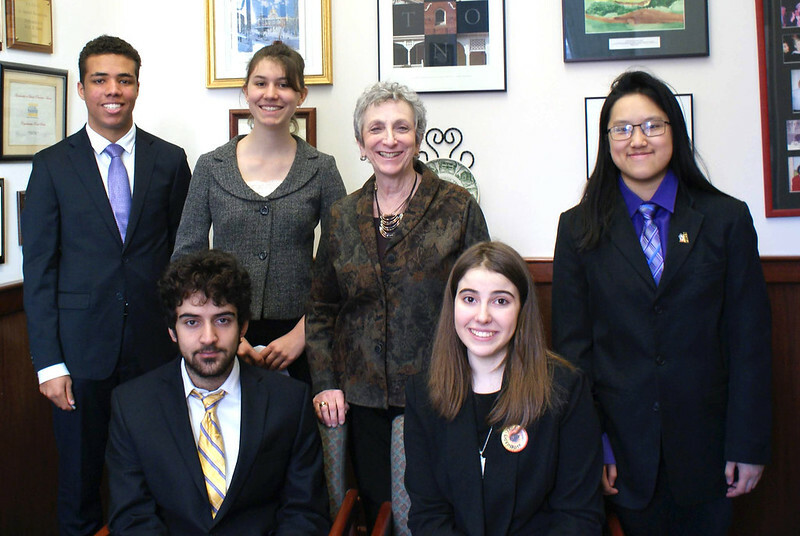 state representative Ruth Balser. 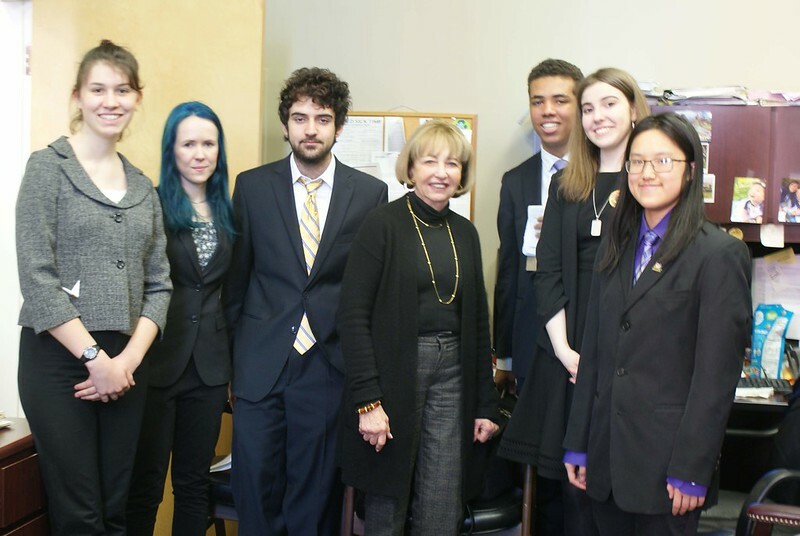 LigerBots with Emily Izzo from the office of Mass. state representative John Lawn. LigeBots with Mass. state senator Cynthia Stone Creem. 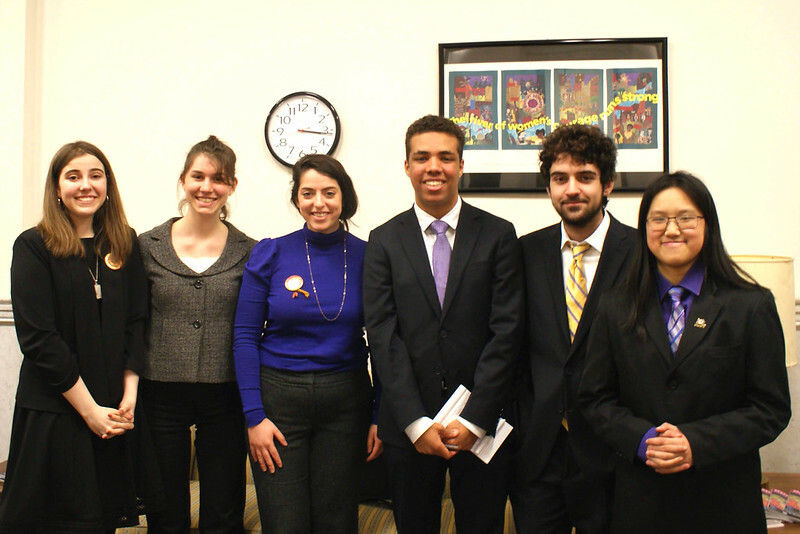 LigerBots with Amani Mansour from the office of Mass. state represenative Kay Khan. 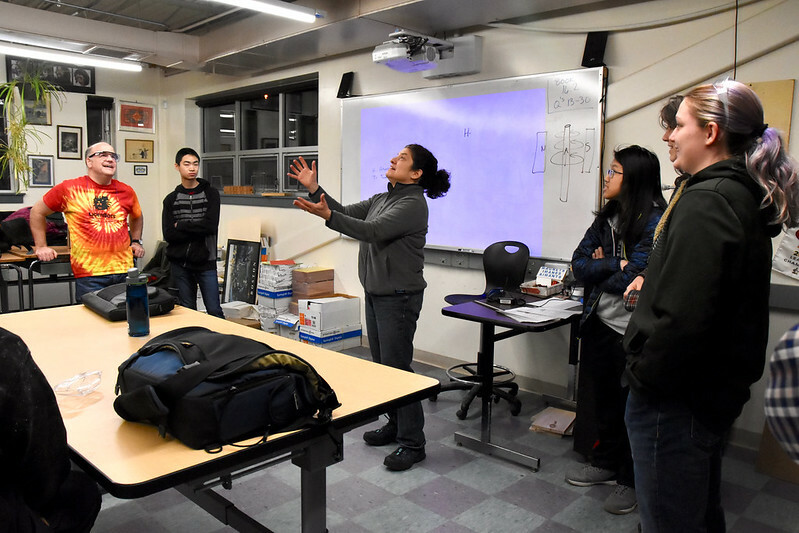 We hope to get to know our representatives better during the coming months and to talk to them frequently about funding STEM initiatives in Massachusetts. Coming up: the 2019 FIRST National Advocacy Conference next June, in Washington, DC! Our Robot Is in the Bag! 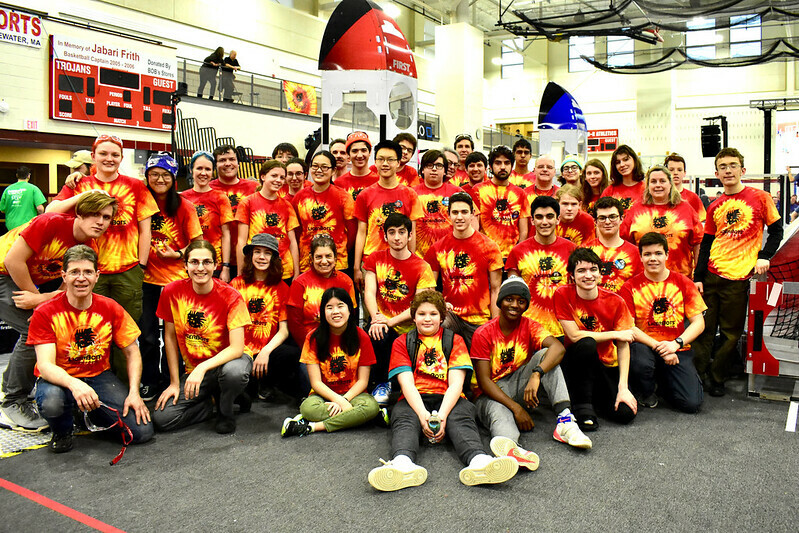 The official build season has come to a close and our robot is in the bag! 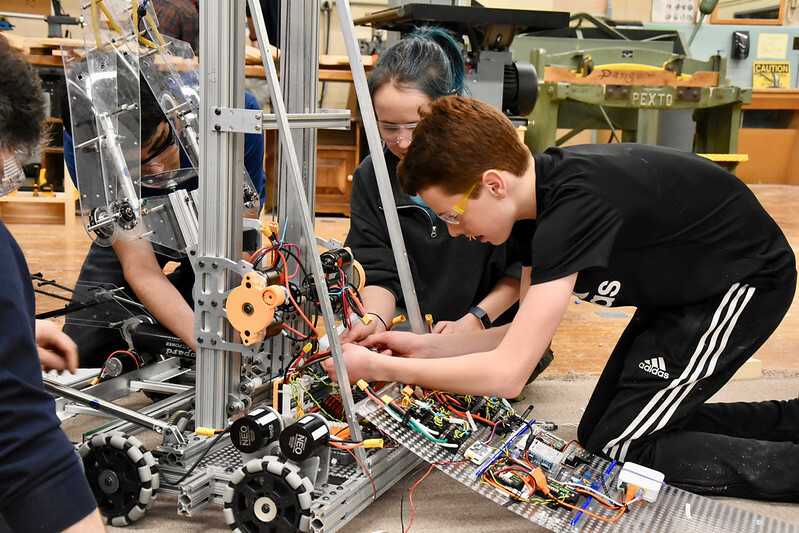 The last few days of the build season took place over the February school vacation, but our tireless LigerBots students and coaches spent every waking minute over the holiday weekend debugging the robot so it will be ready for the SE Mass. District Event in Bridgewater on March 9. 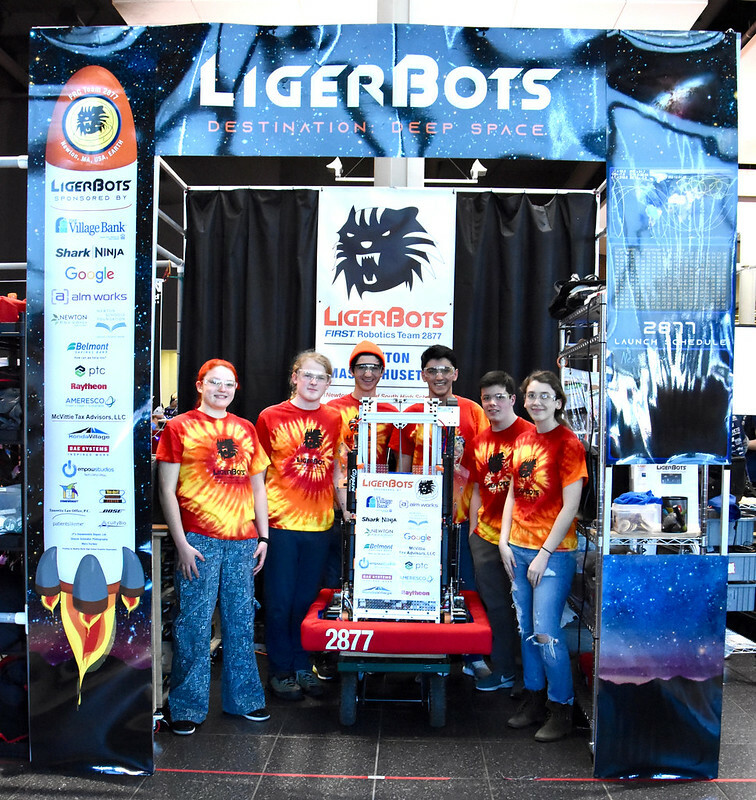 The LigerBots right after bagging our competition robot on Feb. 19. The scene on the last day of build, as programmers, mechanical and electrical engineers all raced to finish the robot. 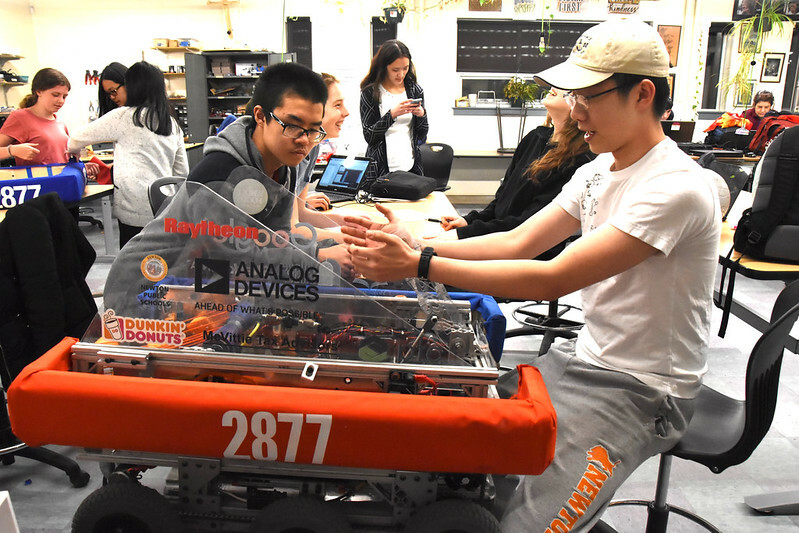 We will have two cameras on this year’s robot: one that gives the human driver a view of the field, and another one that allows the robot to “see” the reflective vision targets on the field elements and automatically align to them. Both of these kinds of robot vision are crucial to this year’s robot. There will be an initial, 15-second “Sandstorm” period in each match when an opaque screen will block the human driver’s view of the entire field. During that time we will be completely dependent on the cameras to know where our robot is and where it is going. And, even after the Sandstorm period is over, the human driver will use both cameras and the vision software to automatically line the robot up to the Ports and Hatches. The robot lines up to deposit Cargo into the Rocket field element during last-day testing. We made video clips of these practice sessions and set them to music in our robot reveal video. Ian shoots video for our robot reveal video while Coach Fitzpatrick observes the robot’s performance as it places Cargo into the Cargo Ship field element mockup on the last day of the build season. 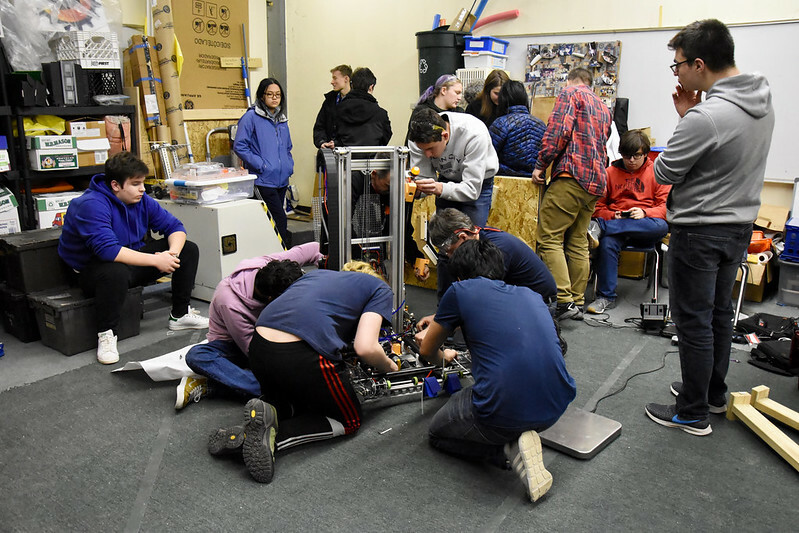 Our final touch on the last day was to test the fit of the wood and aluminum perimeter frame so we can put the bumpers (that are still in progress) on the robot right before competition. Sophia, Ali and mentor Paul Rensing test the fit of the wooden bumper frame. 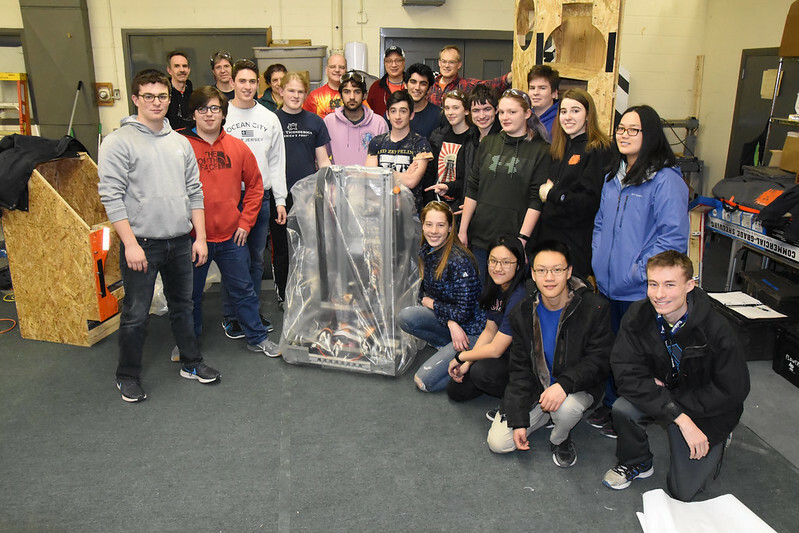 As the last hour of the season came to a close we gathered around the robot as it was weighed, slipped into its giant plastic bag, and a photo was made of the zip-tie tag that shows we bagged in time, by the rules. Asa, CTO Samy and co-head coach John Fitzpatrick bag the robot. But, the work is not done after bagging the competition robot. We will continue work on our second robot right up until the Bridgewater competition (and beyond.) 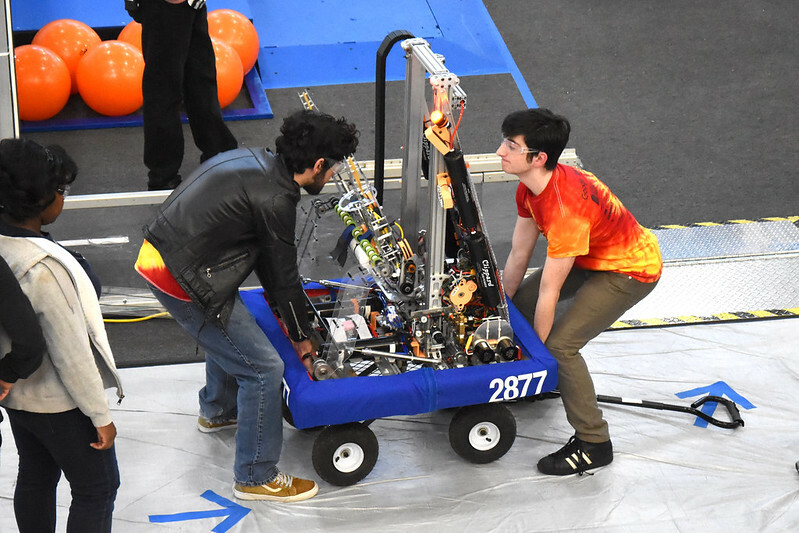 Having a second robot allows us to continue testing and improving our systems and allows our driver to get more practice before our first competition. 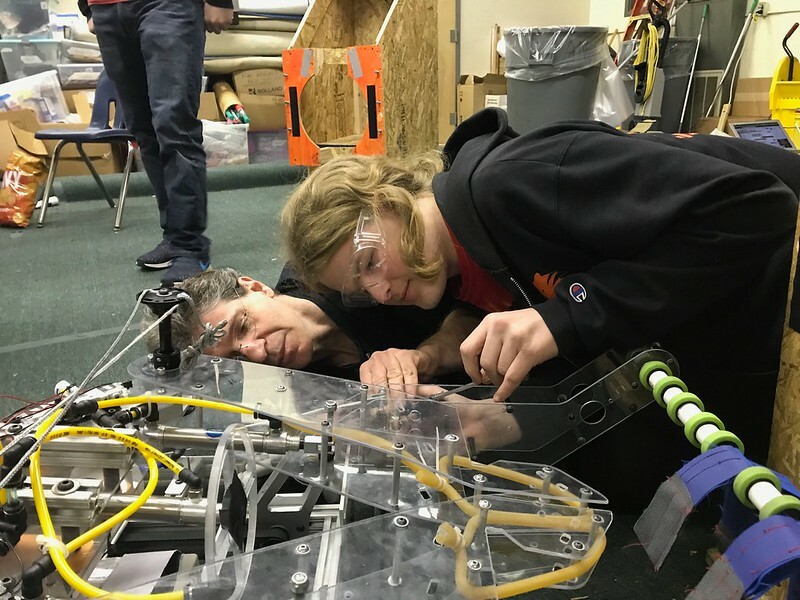 Asa and mentor Carly Buchanan wire the second robot as co-head coach Noa Rensing watches. 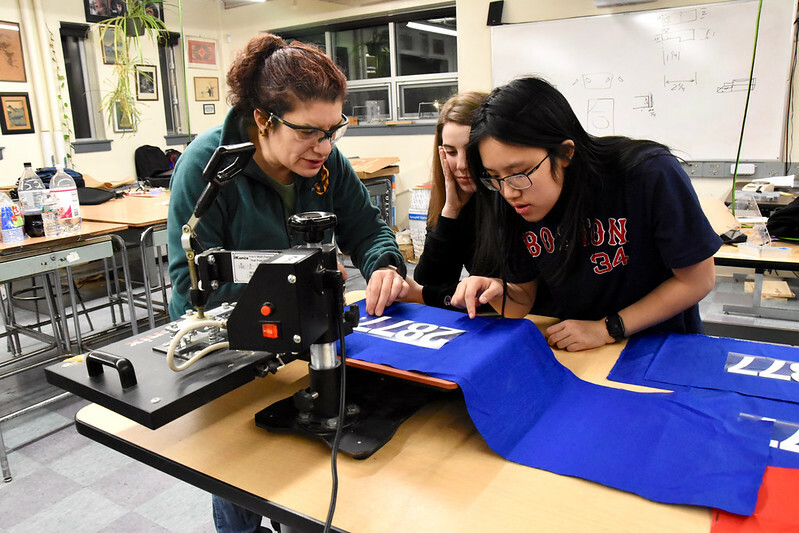 AJ, Carolyn and c0-head coach Noa Rensing apply team numbers with a heat press to the bumper fabric. 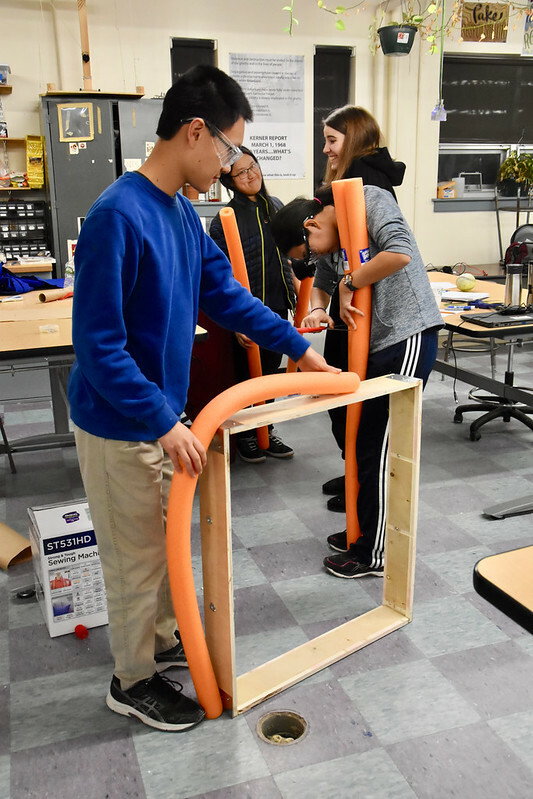 Daniel stretches a pool noodle bumper around the frame perimeter in preparation for covering the bumper with fabric. The 2016 robot made its most recent outreach outing to the MIT Blueprint hackathon last weekend—even during the last days of build we have found a way to do outreach! 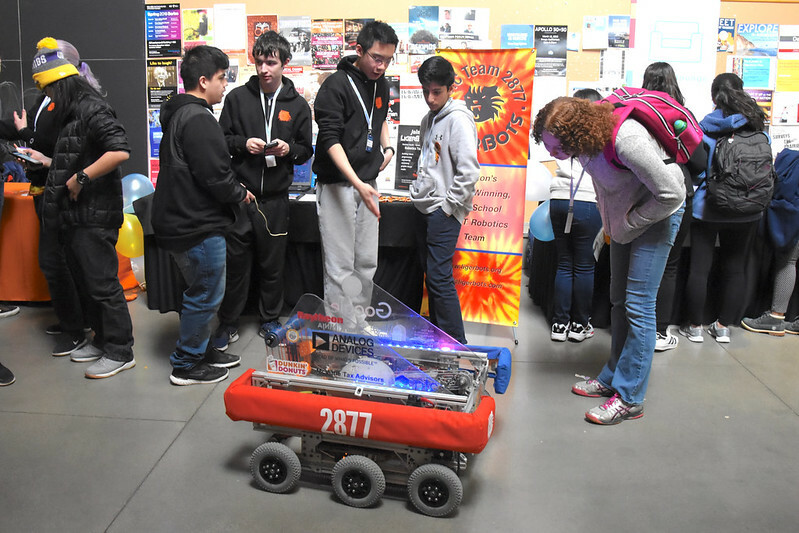 We demoed the robot and talked to local high school students about the LigerBots and FIRST Robotics during lunch at this learnathon and hackathon at the Stata Center. The participating students were very enthusiastic and interactive, and eager to drive our robot and make binary bracelets. Brad explains the 2016 robot to an attendee at the MIT Blueprint learnathon. A student makes a binary bracelet at the learnathon. LigerBots are everywhere! 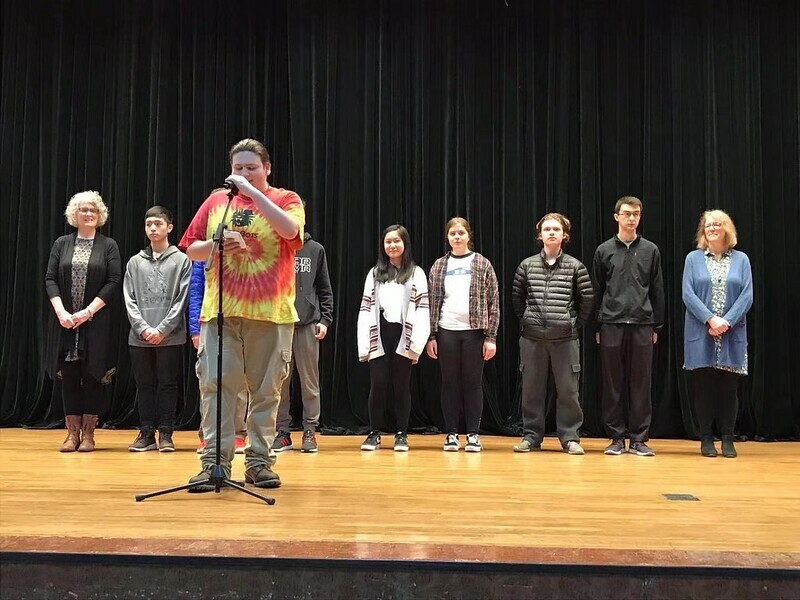 Matthew, a LigerBot who has recently left on a Newton Public Schools exchange to China, recently wore his LigerBots shirt as he gave an introductory speech about his group of American students to the entire Jingshan school where the exchange takes place. Matthew addresses the Jingshan school where his group of Newton High School students has recently arrived for an exchange program. We now have our 2019 team tee shirts and our printed pit banners! 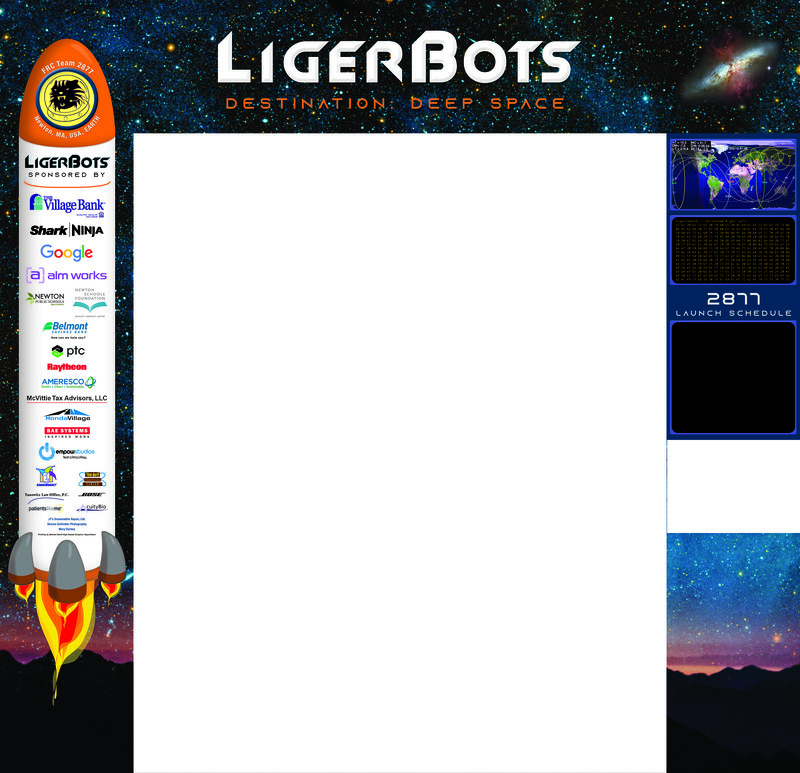 We are totally into the theme of this year’s game, Destination: Deep Space. Thaddeus J. Liger(naut) and our valued sponsors are prominently displayed on these items. 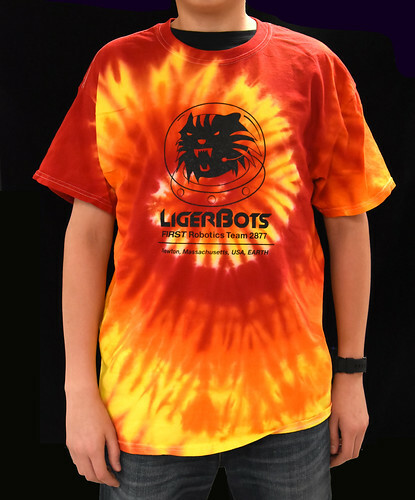 LigerBots 2019 tee shirt front. Bonus points for anyone who can decode the hexadecimal message on one of the banners’ mission control “monitors.” We are still hard at work on our team guide booklet and on the flyers that will explain our robot’s features to FIRST judges and other teams at competition. 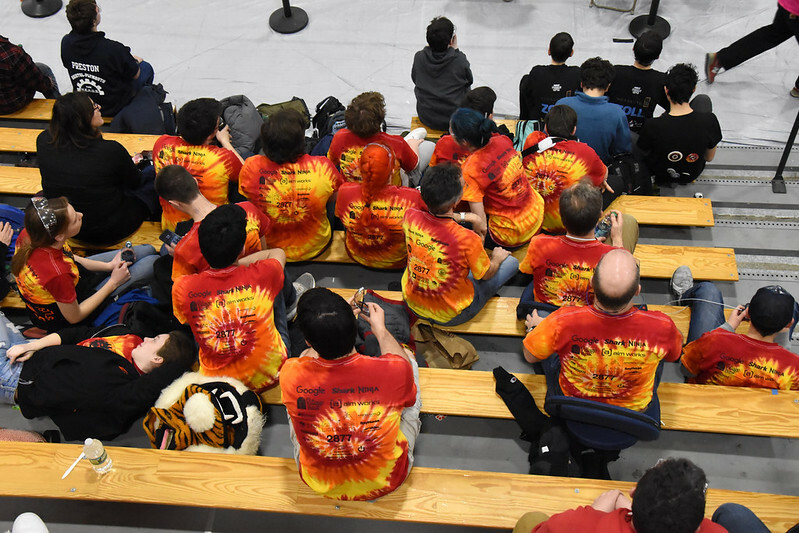 Our first competition of the 2019 season is the New England District SE Mass Event at Bridgewater-Raynham High School which takes place on Saturday and Sunday March 9th and 10th. Free to watch. Come on down! 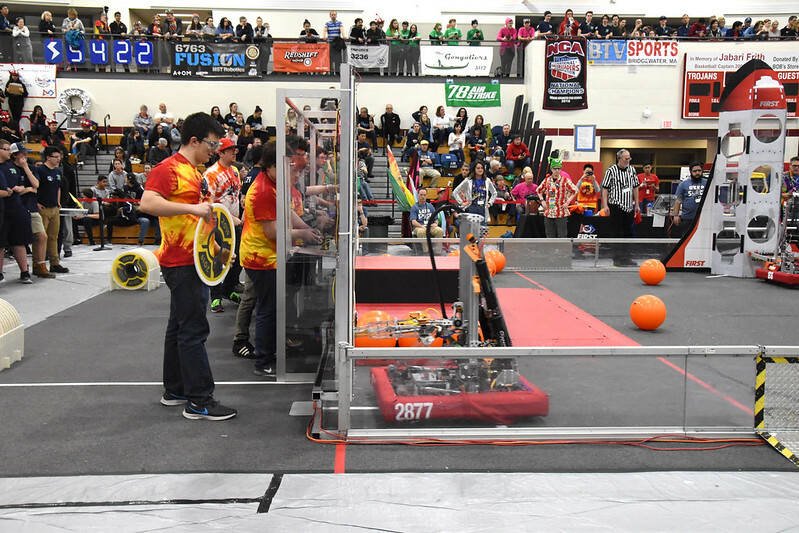 The event should also be live streamed via Twitch TV or the Blue Alliance site. Try this link once the competition launches (about 9 or 9:30 am). 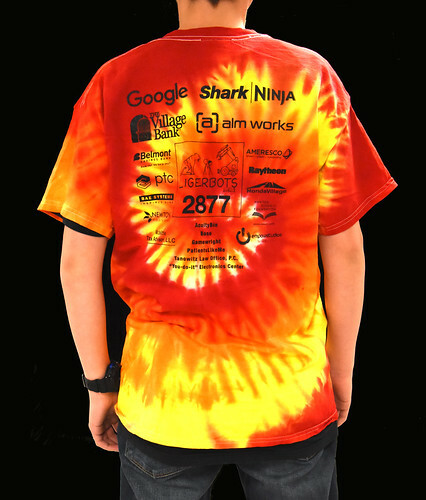 Here is a link to the Blue Alliance page listing the teams that will be participating. Typically the competition viewing is 9am – 5:30pm with a break for lunch. Exact times can shift if the event runs behind. We are in the final stretch! 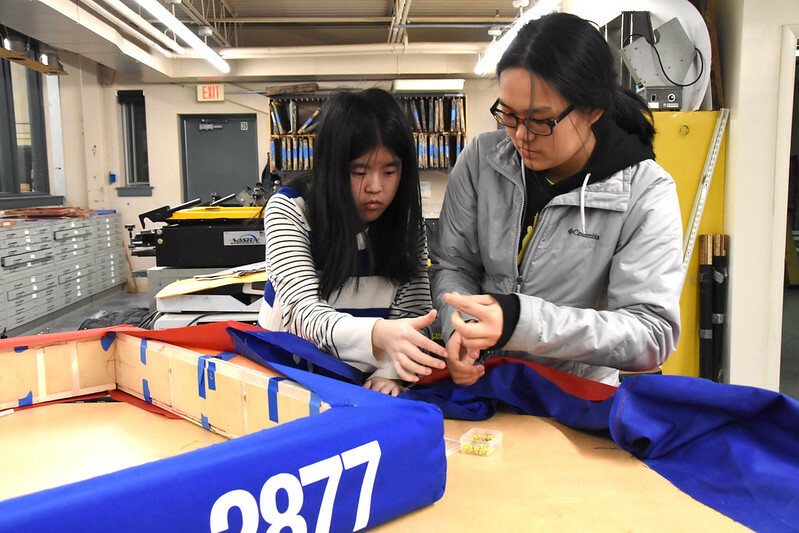 Bag day on Tuesday Feb. 19 signals the end of build season and moves us into competition season. 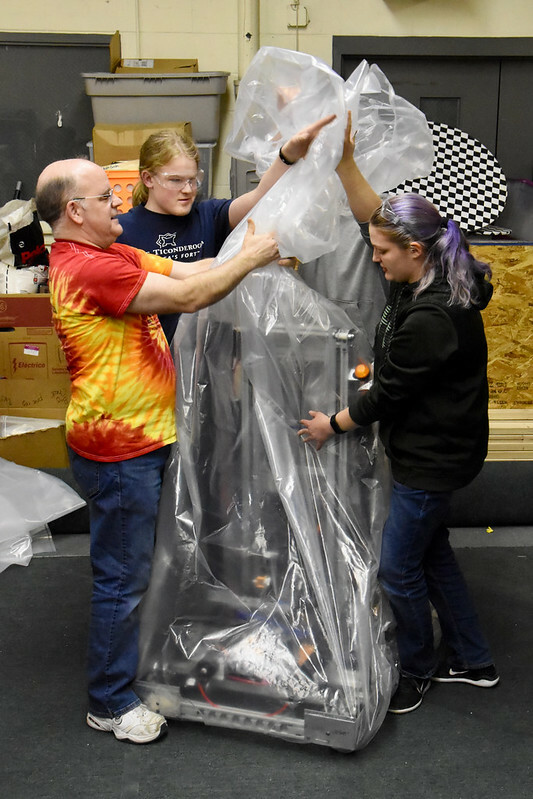 “Bag day” means that we will literally be packing up our competition robot in a massive plastic bag, and we cannot touch the robot again except for during a few designated hours in the week before our first tournament. (Our first tournament is the SE Mass. District Event at Raynham High School in Bridgewater.) We need to have our robot in drivable, bumpered and mechanized condition before we bag it. Mark installs the electrical panel. This week we have installed the robot’s pneumatic system and have soldered and wired the electrical system with extreme precision, making sure that there are no short circuits or other small errors that would hamper our robot. The robot as it stood midweek, after the pneumatics and electrical panel were installed. 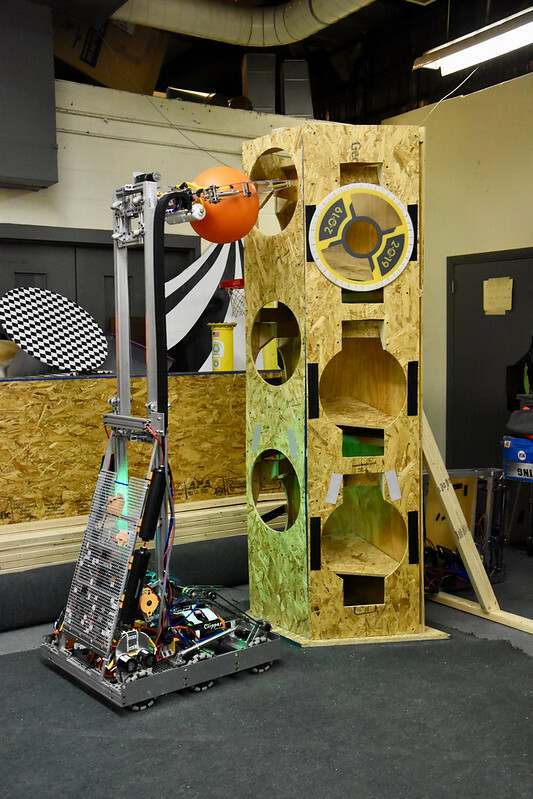 Our software group has written code that allows our robot to pick up and move the cargo (balls) and hatches (discs) effectively, and they are solving some software issues with controlling the ball intake and the motion of the elevator. They have also written an algorithm and code for the camera system that will allow us to see where the robot is going during the “sandstorm” period at the beginning of a match, when the vision of our drive team is blocked. Mark writes code to control the electrical board during a test phase. Our CADing group continues to work on 3D models of our electrical components, elevator, and ball intake. 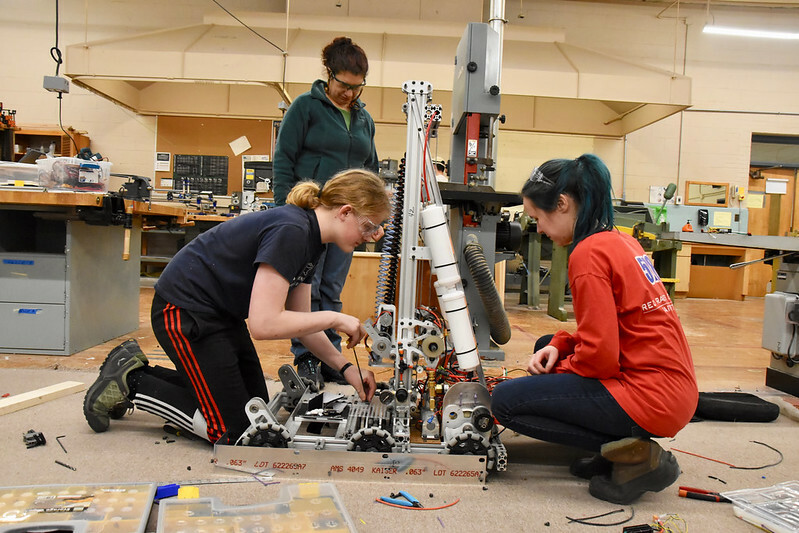 They have been making small design changes to ensure that the various robot systems work correctly together—this is despite the assortment of technical problems they have been having with our CADing program. We finished cutting the robot’s perimeter plate, which is the exterior wall of the robot where the bumpers are mounted. 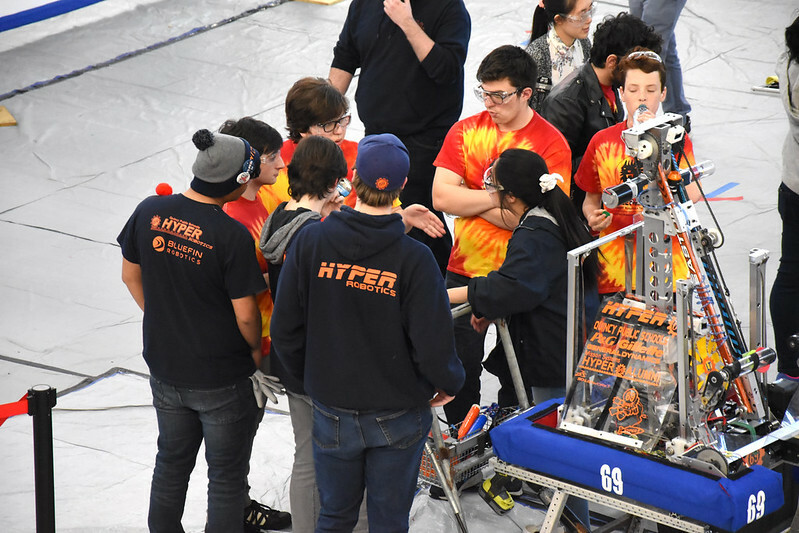 Our next step is to build the pool-noodle and cloth bumpers that can flip from red to blue, depending on which alliance color we’ve been assigned to for a match. These carry our team number in large letters so everyone knows that it’s the LigerBots robot they’re watching! 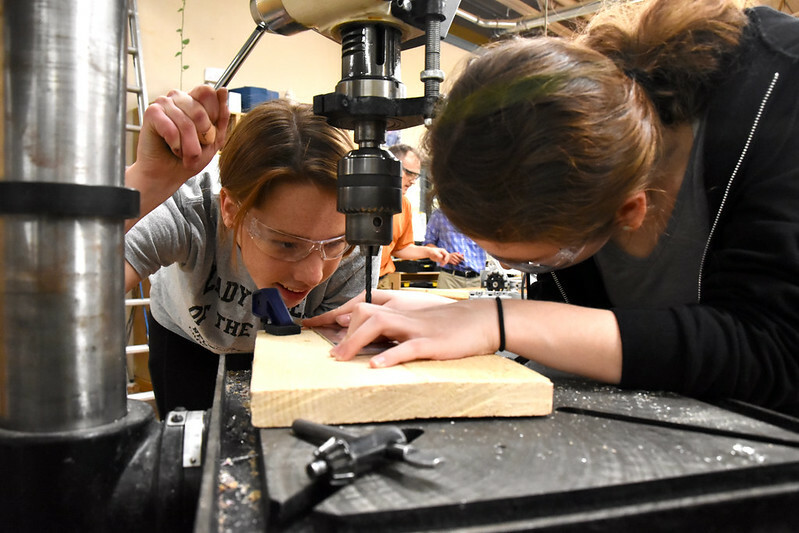 Sophia and Maya drill an aluminum perimeter plate. 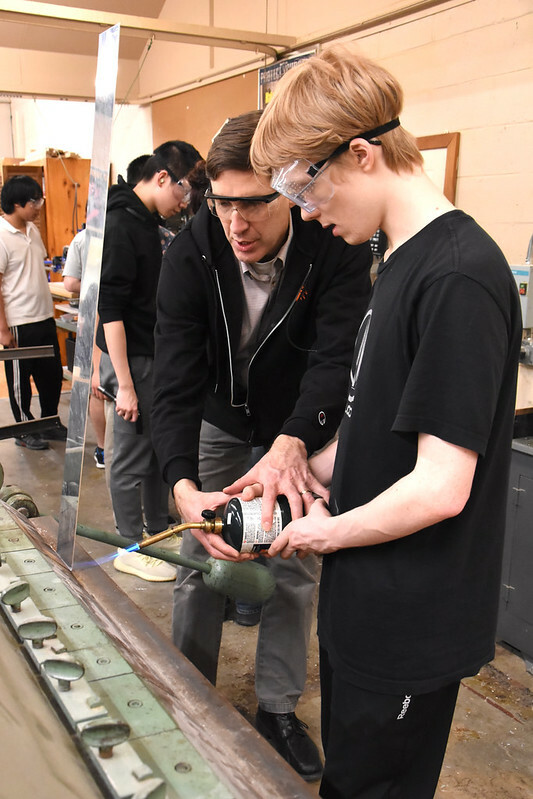 David is assisted by mentor Jordan Schwartz to blowtorch and bend an aluminum plate for the robot perimeter. We have also built a second robot chassis this year so we can continue to work on our designs after we bag our competition robot. 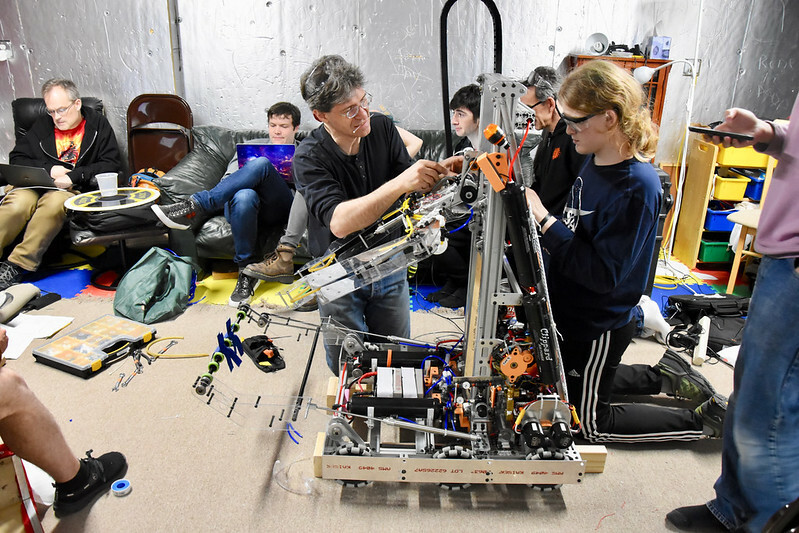 We are allowed to keep 30 pounds of our 125-pound competition robot out of the bag as a “withholding allowance” for further improvement, so we have decided to retain our claw and ball intake for more work. We will mount these mechanisms on our second chassis along with any other system we might want to add to the competition robot right before a tournament. 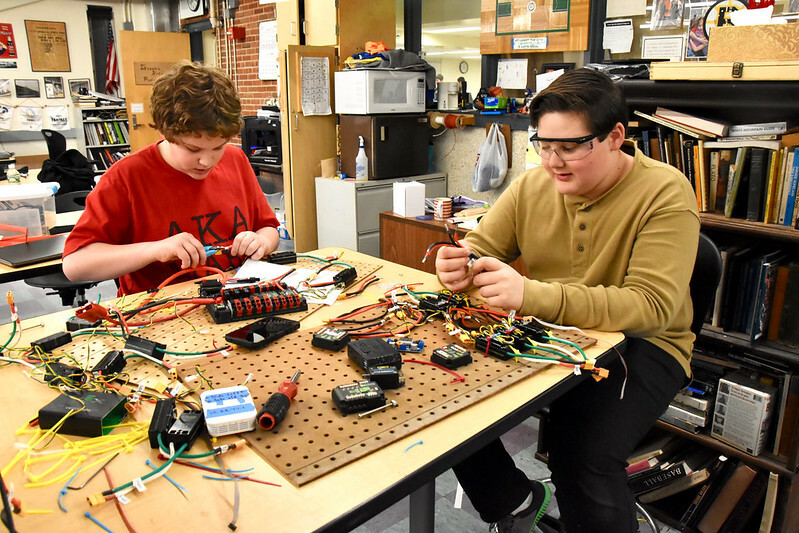 Yonik and Jay work on the electrical panel for robot 2. Michelle works with mechanical mentor Mark Zeren to drill a piece of 80/20 bar for the second robot. Randy and mentor Josh Sapers construct the frame of robot two. 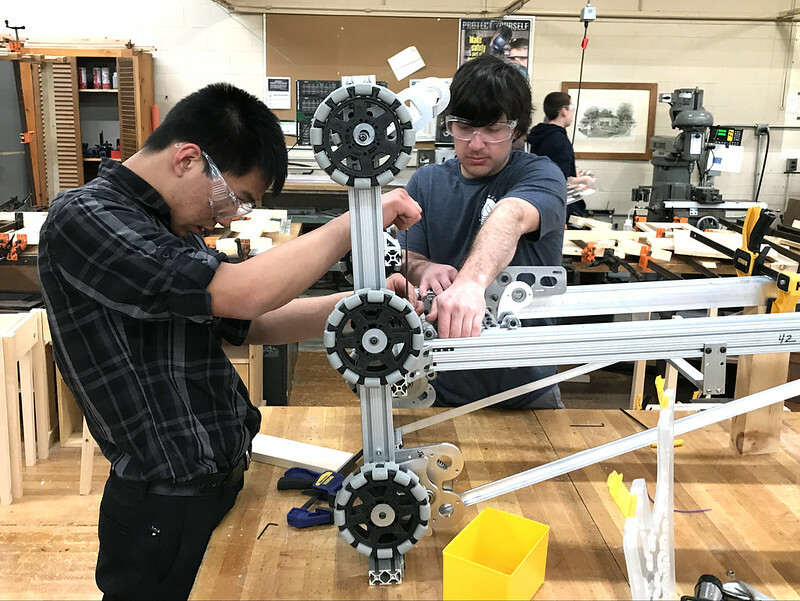 In the meantime, our drive team has been working on a technique to efficiently hold and utilize the robot controller. We’re repurposing an Xbox controller, and our drive team has been figuring out an efficient way to be able to press all the buttons needed while playing a match. We are on target to test our driving by the end of the weekend. 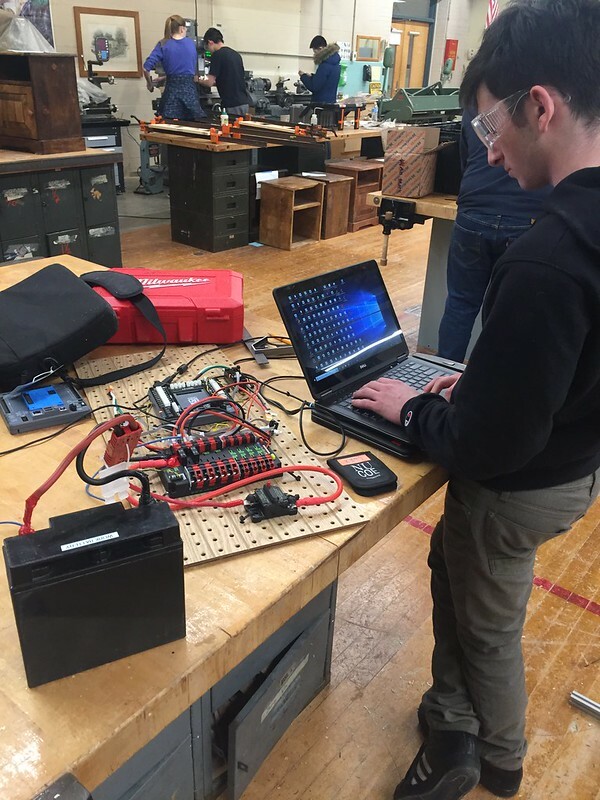 As we race toward the deadline, work on the robot continues off-site during school vacation. 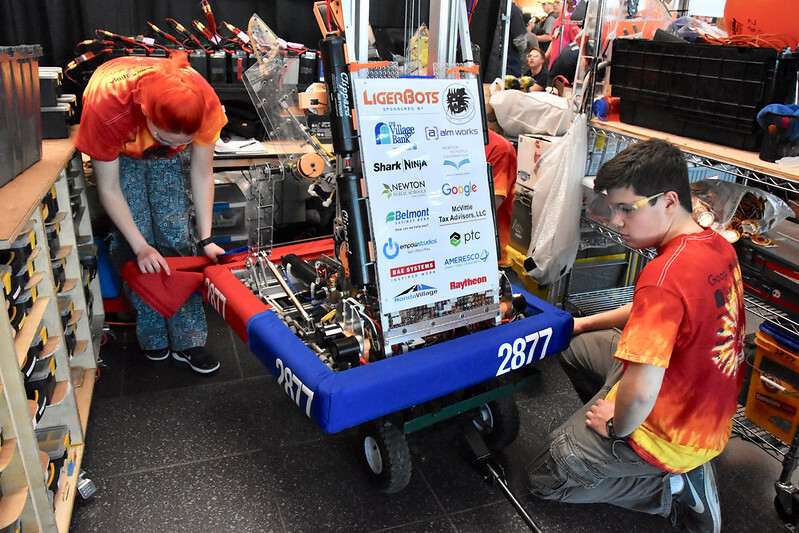 The official competition season has not yet begun, but there are teams who have not only finished their robot before bag day, but are ready to compete! 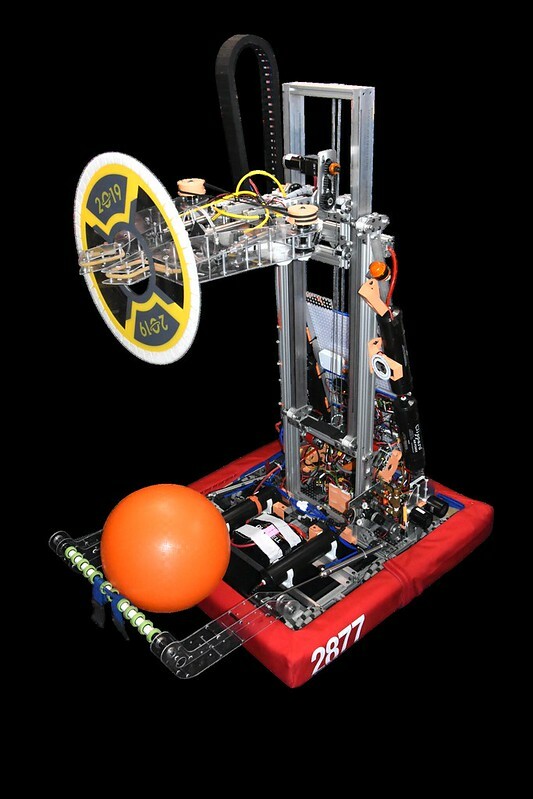 Some have organized unofficial pre-bag-day tournaments so that other teams can test their robot designs and get in some driving practice in a realistic game setting. Our strategy council has assembled a group of team members to start scouting practice this weekend for week 0. 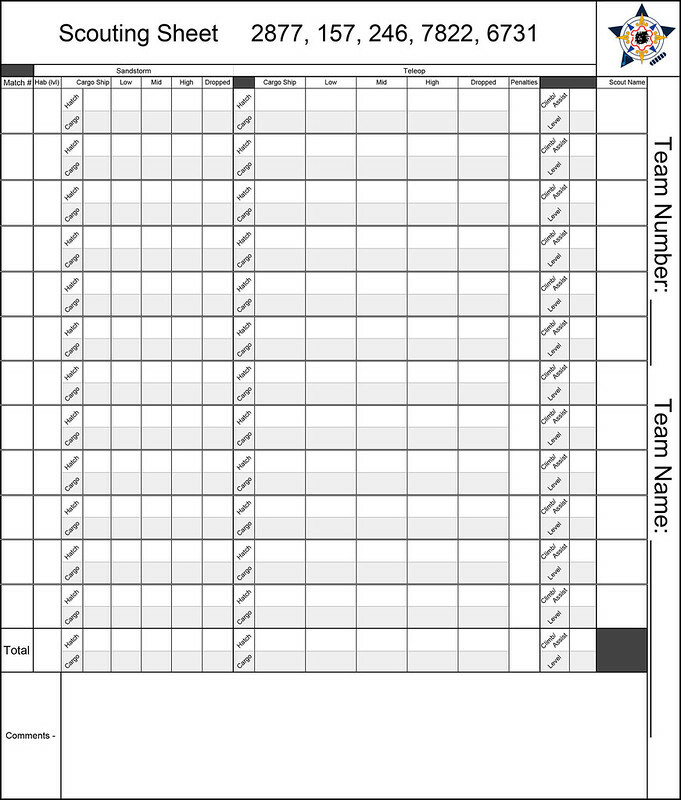 We will use these preseason competitions to test out the scouting sheets and scouting process we will use this year. 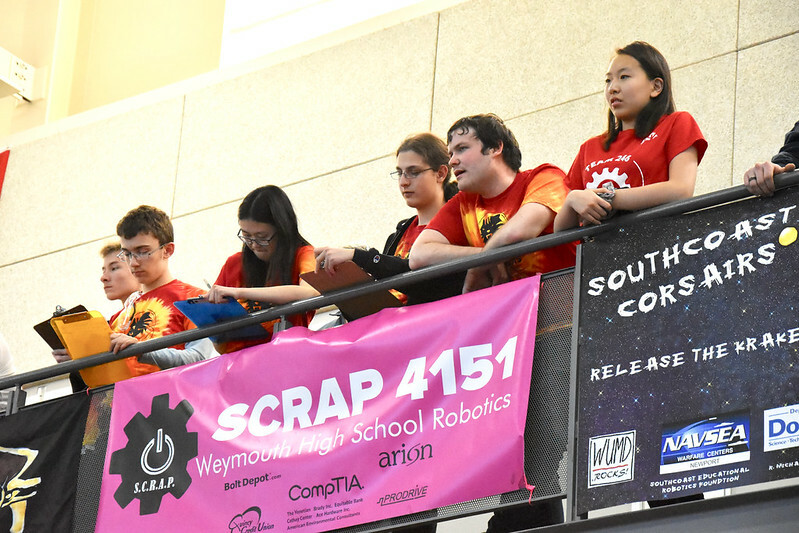 Our scouting alliance continues to grow, and we welcome 6731, Record Robotics! We have further “turduckened” our alliance logo to accommodate this new addition. The next step would be to train our alliance teams on scouting so that we will all have useful data and a successful season. The scouting sheet for our new scouting alliance. The participating teams are listed by number at the top, and the logo includes pieces of all of the team logos. 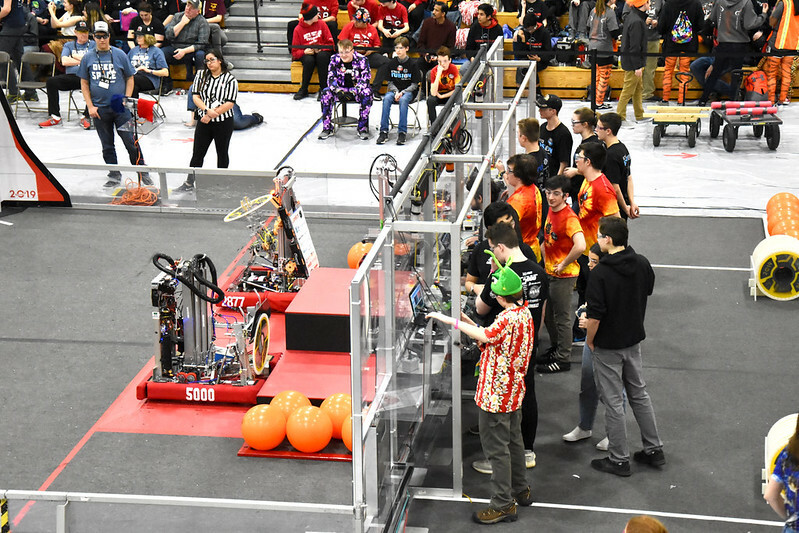 As noted in previous posts, winning the Chairman’s award would advance us to the next level of competition regardless of how our robot performs. It also would announce us as one of the teams that best expresses what the FIRST organization represents. We previously won the award in 2015 at both the district and NE Championship level. Last week we submitted our essay and questions to FIRST. 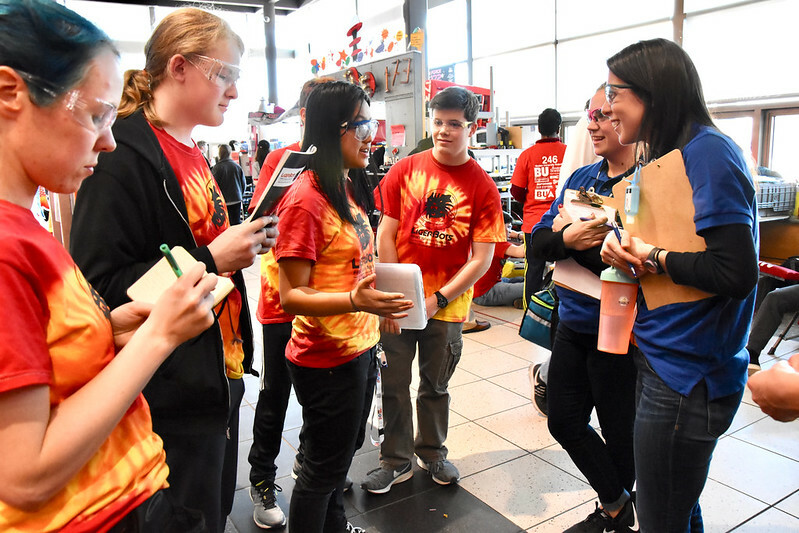 The other piece of the judging process involves formal and informal presentations at our competitions, so we continue to work on refining our presentation, practicing our elevator pitches and preparing materials like our team overview booklet and flyers. We have even sung and recorded a song for the Chairman’s video, which would get played on a large screen for everyone at the competition should we win. 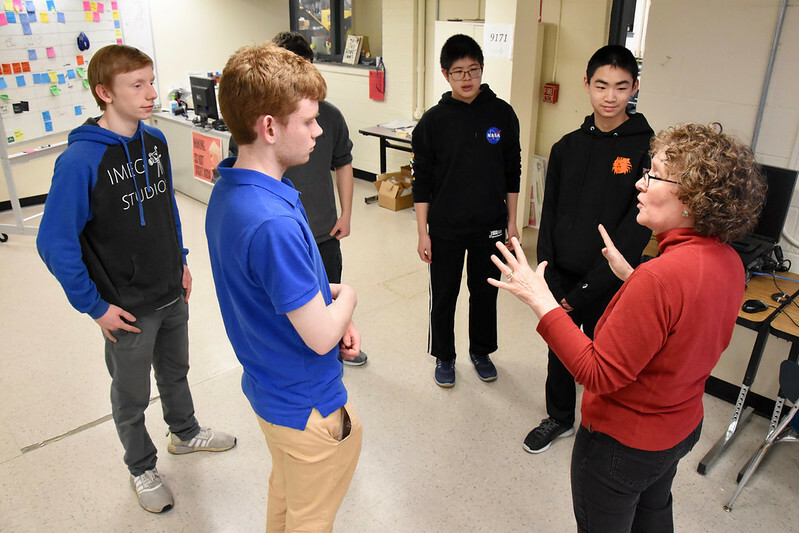 Our new public speaking mentor, Elizabeth McVittie, trains a group of students on how to use good voice techniques and body language to enhance a conversation with judges. We have been working on our robot reveal video and preparing for several upcoming outreach trips and events. 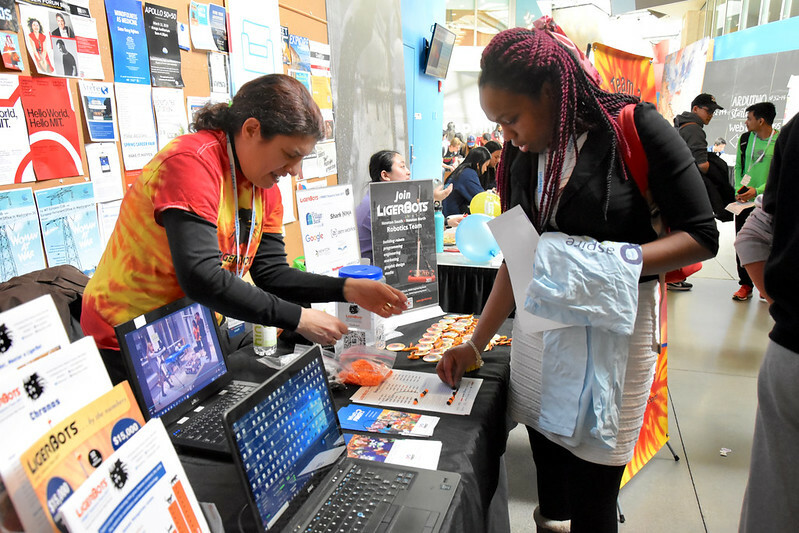 On Feb. 23 we will be at the MIT Blueprint hackathon with an activity booth and on Feb. 26 we will be meeting with local politicians at the Southern New England Advocacy Conference (SNEAC) about STEM initiatives. This week we welcomed ALM Works as a new Puma level sponsor! Their donation helps us make up for the loss of one of our larger sponsors earlier this year. 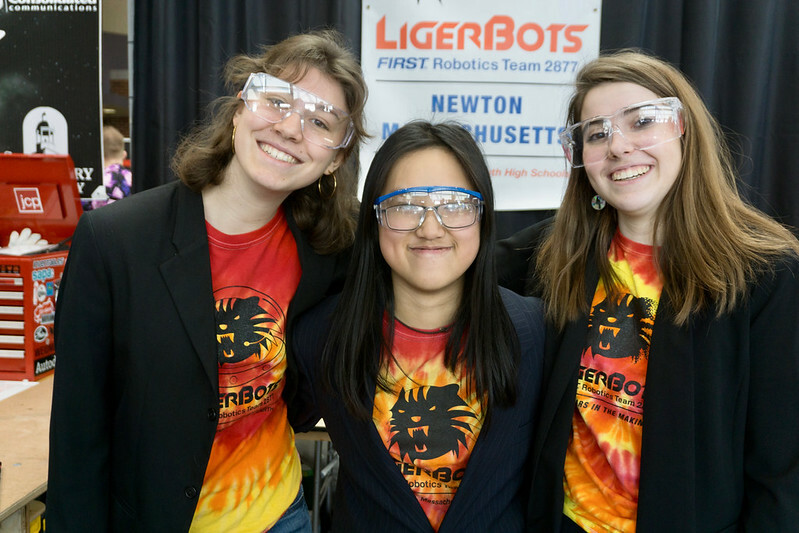 This means that we can continue training our team members, building robots and promoting STEM in Newton. It is really great to see just how far we have come since the start of build season.